Animal Advisory Committee Meeting Thursday, August 23rd, at 6:30. This meeting is being held at the Friend Room at the Sawyer Free Library. 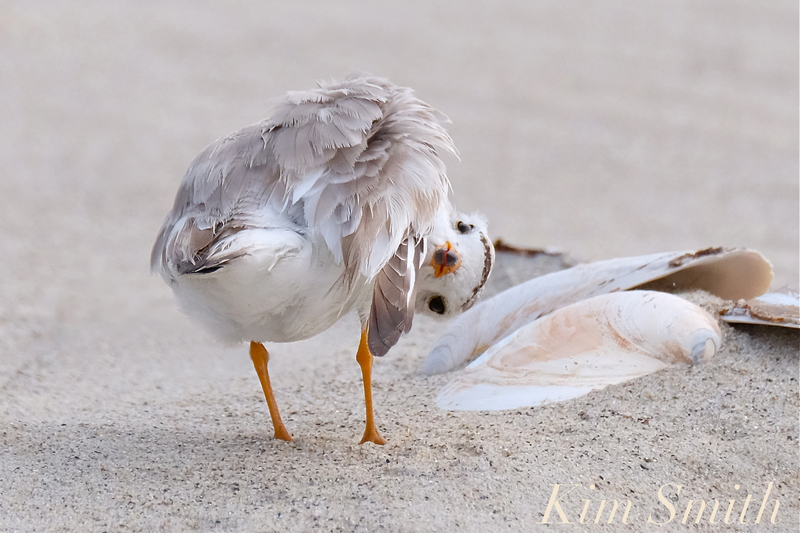 Lest anyone has forgotten, a beautiful pair of Piping Plovers tried to establish a nest on Good Harbor Beach during the month of April. 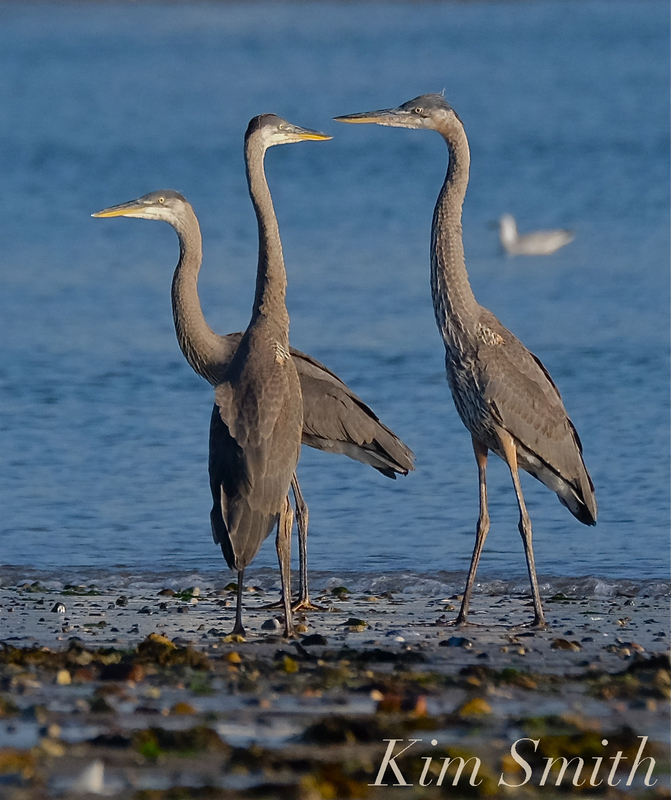 Time and time again, they were disrupted by dogs–dogs off leash on on-leash days, dogs running through the nesting area, and bird dogs chasing the birds up and down the shoreline. 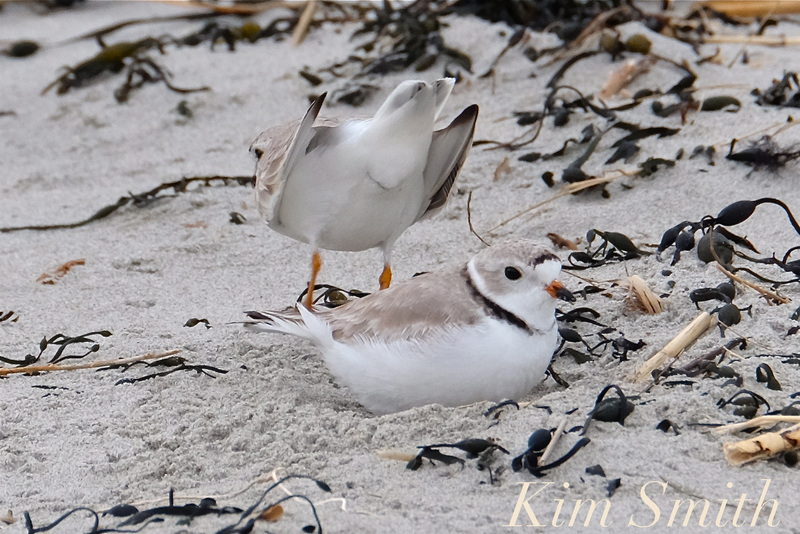 This was witnessed multiple times during the month of April by the Piping Plover volunteer monitors. Piping Plovers face many man made problems and natural predators however, the two greatest threats at Good Harbor Beach are dogs and crows. 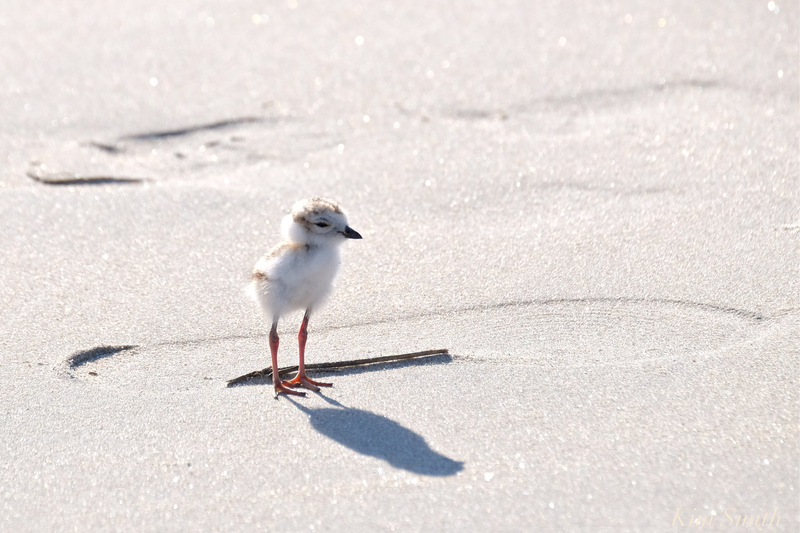 Changing the ordinance on Good Harbor Beach to help the Piping Plovers will at the very least allow them to nest in their natural environment. Our parking lot nesting pair were extremely stressed having to defend both territories, the parking lot nest and their roped off territory. 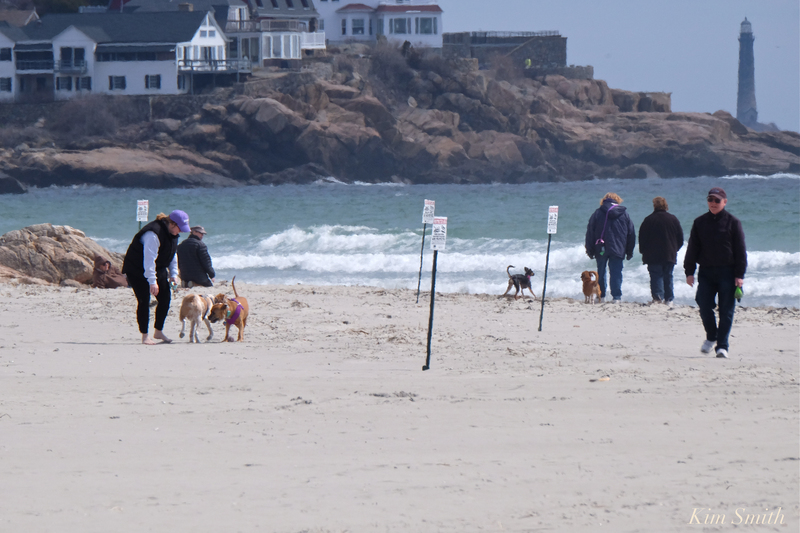 Please let Mayor Sefatia and city councilors know that you support the change in ordinance to restrict dogs on Good Harbor Beach during the month of April. 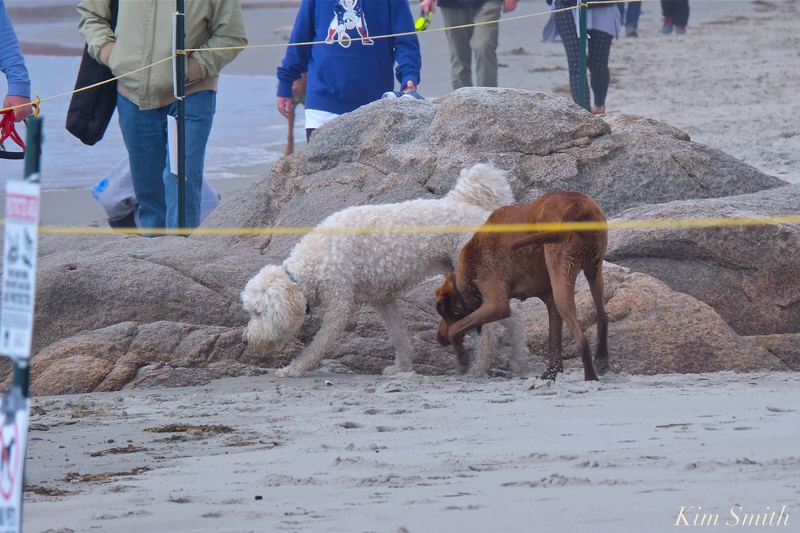 The following series of photos shows why it is so critically important to not allow dogs on Good Harbor Beach during shorebird nesting season, which begins April 1st on most Massachusetts beaches. 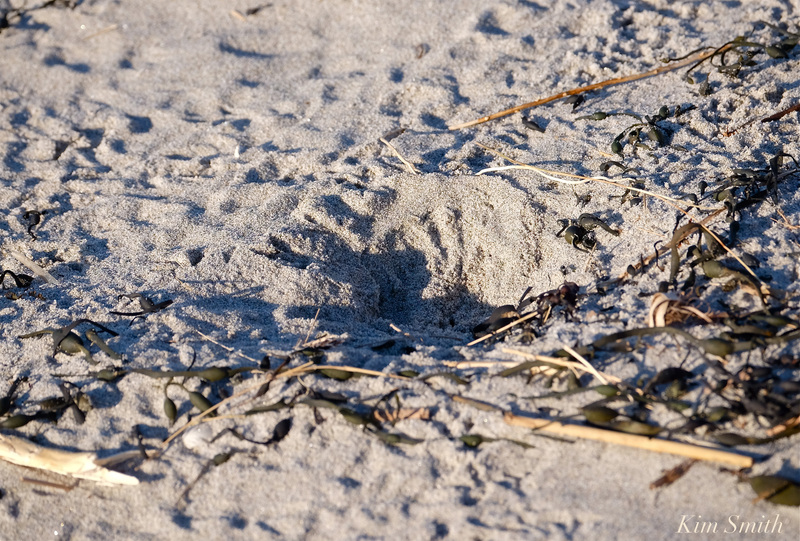 Early April and our returning Good Harbor Beach Dad begins making nest scrapes. He invites Mom to come inspect his handiwork. She tries the nest on for size and approves! Mom appears plump and ready to begin laying eggs. 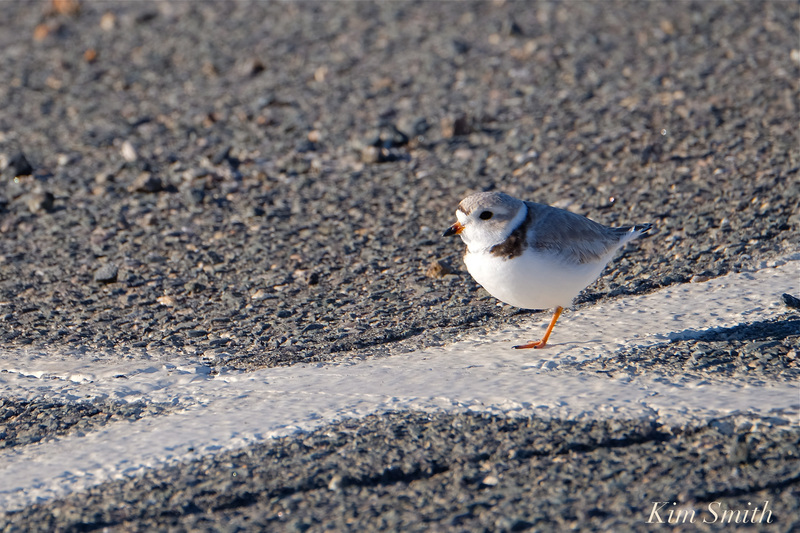 Mid-April and after days of dogs running through the nesting area, the Piping Plovers are discovered standing on the white lines in the GHB parking lot. 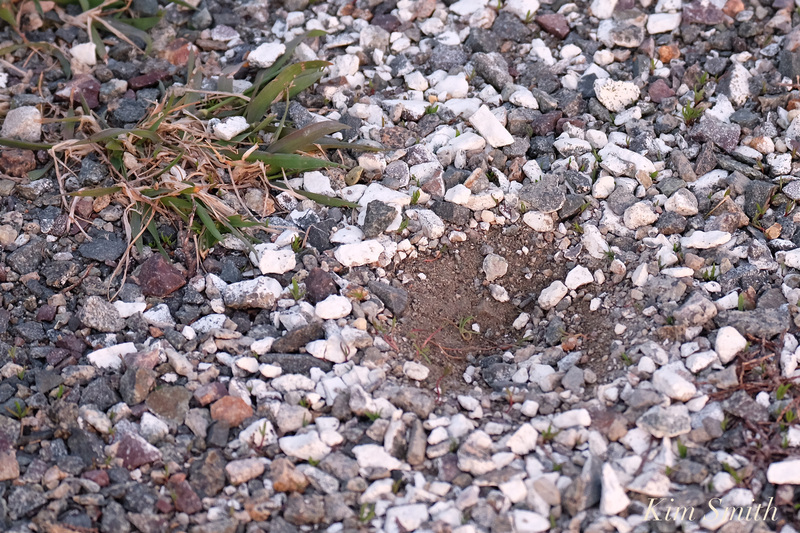 Dad begins making nest scrapes on the painted white lines in the parking lot gravel. 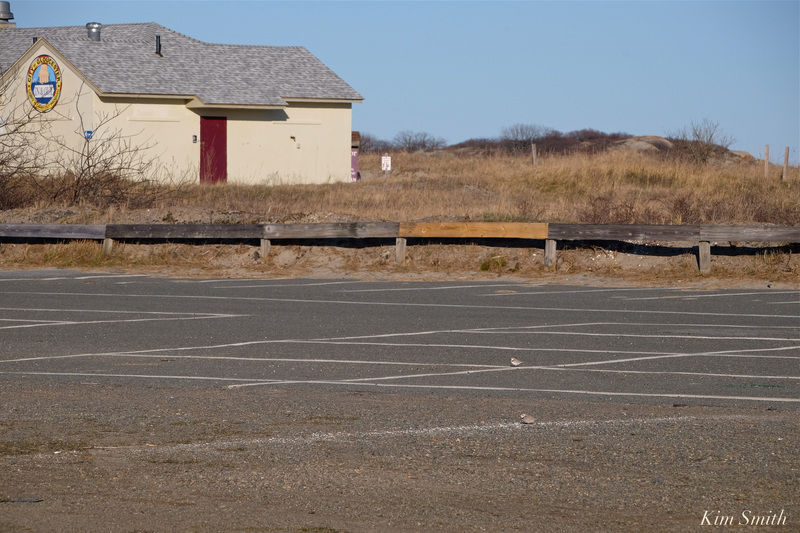 With fewer cars in the lot during the month of April, the PiPl determine the lot is safer than the beach. They give up trying to nest on the beach and concentrate solely on the parking lot nest. Dad invites Mom to inspect the parking lot nest scrape. She begins laying eggs in the parking lot (four total). This entry was posted in #sharetheshore, Birds, Birds of New England, Cape Ann Wildlife, Gloucester, Gloucester Plover, Life at the Edge of the Sea, shorebirds and tagged #SavetheShore, #shorebirdsgoingextinct, animal advisory committee, Charadrius melodus, dogs and plovers, Gloucester, Gloucester Plover, Gloucester Plovers, Good Harbor Beach, how you can help the plovers, nesting, parking lot plovers, Piping Plover, piping plover eggs on August 21, 2018 by Kim Smith. 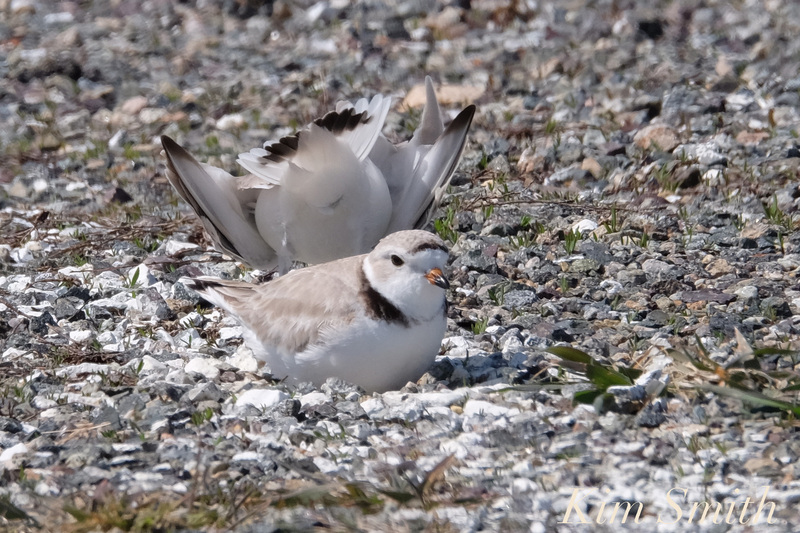 This entry was posted in Birds, Birds of New England, Cape Ann Wildlife, Gloucester, Piping Plover and tagged #SavetheShore, #shorebirdsgoingextinct, Beautiful Birds of Cape Ann, Charadrius melodus, dogs and plovers, Egretta caerulea, Gloucester, Gloucester Plover, Gloucester Plovers, Good Harbor Beach, Great Blue Heron, how you can help the plovers, parking lot plovers, Piping Plover on August 2, 2018 by Kim Smith. ANIMAL ADVISORY COMMITTEE MEETING THURSDAY AUGUST 2ND AT 6:30PM AT CITY HALL. 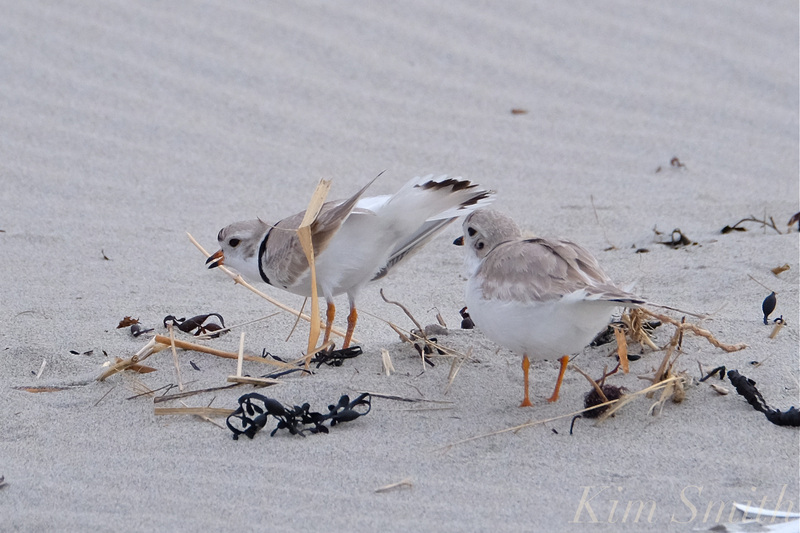 PIPING PLOVERS ON THE AGENDA. Dogs romping within the clearly posted and cordoned off nesting area in April, forcing the Piping Plovers off the beach and to nest in the parking lot. This past spring and summer we had a tremendously difficult time with our nesting bird symbolic fencing. The posted and roped off area is referred to as “symbolic” because it is not an actual physical barrier, but a visual warning to let people know to keep themselves and their pets out of the cordoned off area. People often ask, why can’t more permanent fencing be placed around the nesting area? 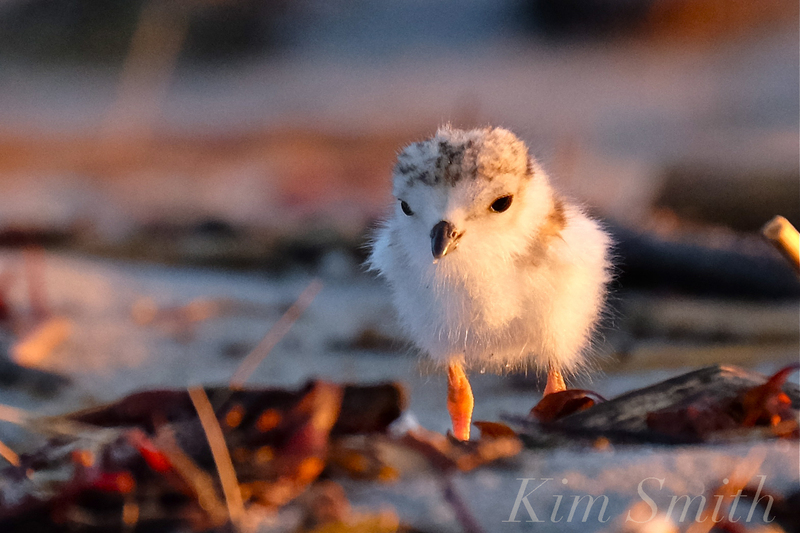 After nearly thirty plus years of working with Piping Plovers, biologists have established that physical fences placed on the shoreline and in the wrack area are all too easily washed away by high tides, create safety issues and, too, you wouldn’t want to trap dogs and predators within a nesting area. The difficulty with our metal posts is that they were knocked about and pushed down with nearly every high tide, dragging the roping into the sand as well. The rope and posts needed almost daily righting. 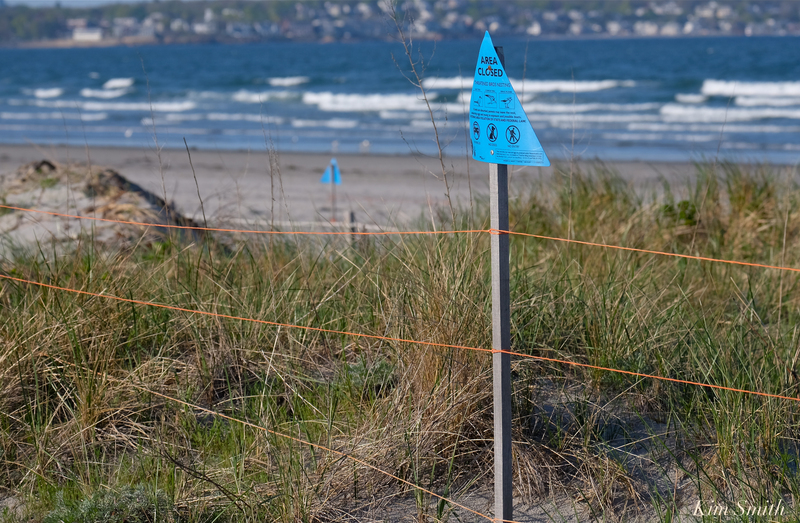 The Massachusetts Department of Conservation and Recreation (DCR), which successfully protects Piping Plovers and other endangered birds at dozens of Massachusetts beaches have come up with what appears to be a good fencing solution for areas within tidal zones. DCR uses long, narrow fiberglass rods which can be pushed easily into the sand. The poles are strung with two rungs of roping, and in some places three rungs. I measured the distances between the poles at Revere Beach; they are placed about every twenty to twenty four feet. 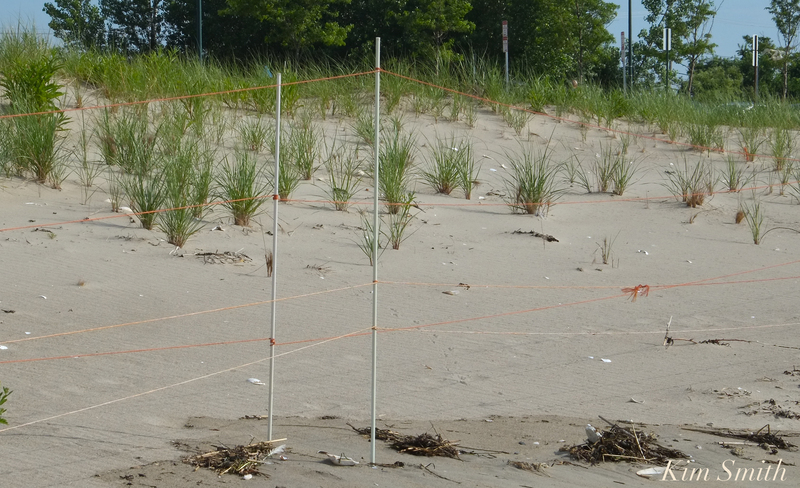 In early spring, before the Piping Plovers and Least Terns have nested, historic nesting areas are roped off. After a nesting pair establishes a territory, a second row of poles and roping are added around the perimeter of the nesting area. The fiberglass poles can be adjusted without too much difficulty. Wooden poles are used to post the nondescript, but informative endangered species signs. According to DCR staff, the only time they have complications with the fencing is when the wooden posts are tied into the fiberglass poles and the tide takes both down. I don’t understand why the fiberglass poles are less likely to shift in the tide, but they don’t shift and appear to work very well in the tidal zone–perhaps because they are flexible and less rigid. If anyone knows the answer to that, please write. Symbolic fencing of the two historic Piping Plover nesting areas roped off between March 15th and April 1st (boardwalk #3 and boardwalk #1). Fiberglass poles placed every twenty feet to twenty four feet. One to two rungs of roping. Wooden posts with endangered species signs installed at the same time and in place by April 1st, but not attached to the fiberglass poles. When active nest scrapes are identified, adjust exisiting fencing, and add a second row of fencing around the perimeter. To the outer perimeter of fiberglass poles, use three rungs of orange roping attached to the poles, extending all around the perimeter. One rung at 12 inches above ground, one rung at about 24-30 inches above ground level, and the top rung at four feet above ground level. Piping Plover volunteers monitor fencing and adjust as needed. The above photo, taken at Good Harbor Beach in early April, shows why it is so important to have the signs and roping in place by April 1st. 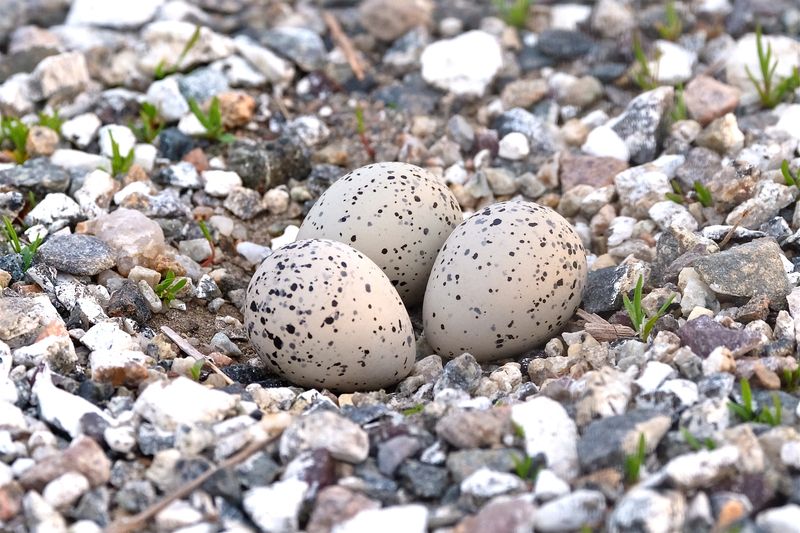 People and dogs were playing in the nesting area while the PiPl were trying to nest. The photo below shows that a second, and even a third rung of roping, placed at dog height, may help to keep dogs out of the roped off area. 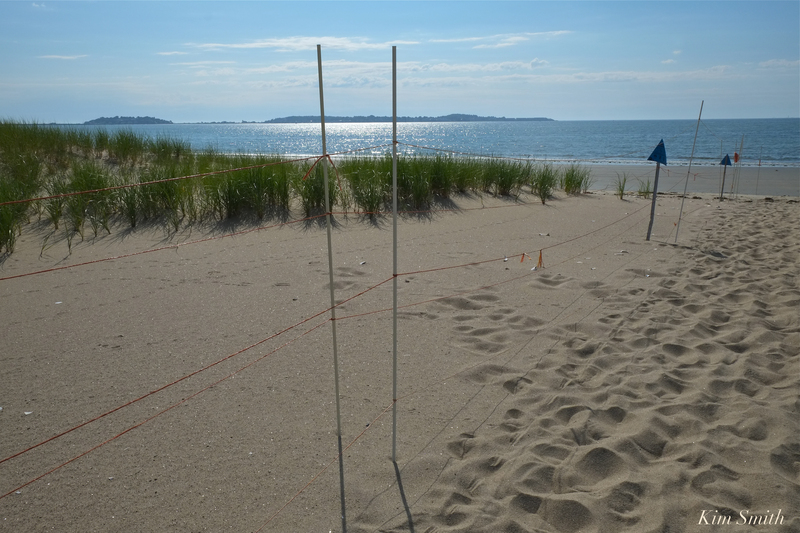 Examples of symbolic fencing areas at Revere Beach and Nahant Beach. Notice the double row of fencing and the double and triple rungs. 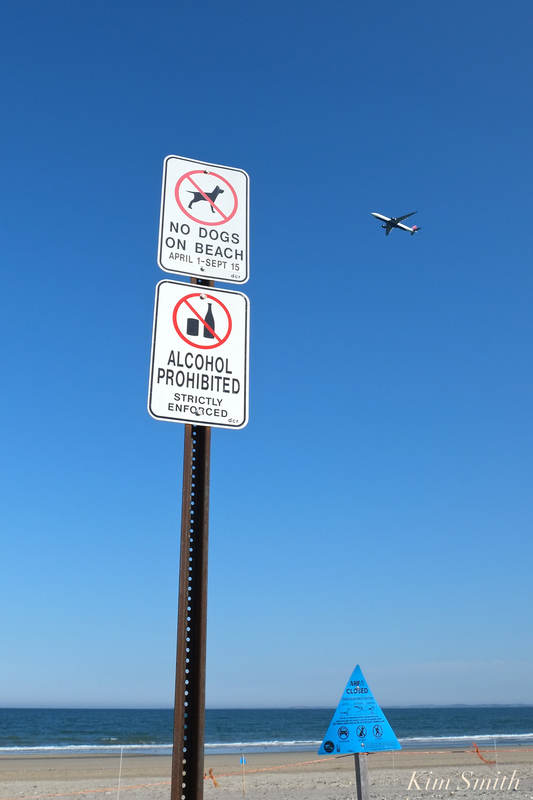 Information is unambiguously posted at Revere Beach. 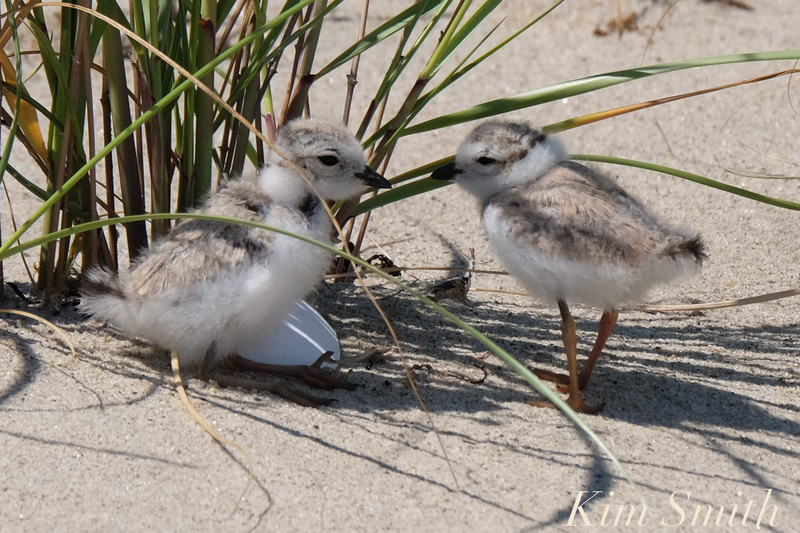 Piping Plover chicks finding shelter in the roped off nesting area on a hot summer day. This entry was posted in Birds, Birds of New England, Cape Ann Wildlife, Gloucester Plover, Good Harbor Beach, Life at the Edge of the Sea, Piping Plover and tagged #SavetheShore, #shorebirdsgoingextinct, Beautiful Birds of Cape Ann, Charadrius melodus, dogs and plovers, Gloucester, Gloucester Plover, Gloucester Plovers, Good Harbor Beach, how you can help the plovers, Mass DCR, Nahant Beach, parking lot plovers, Piping Plover, Revere Beach, Winthrop Beach on August 1, 2018 by Kim Smith. I love how the pale seashell coral pink in the clam shells mirrors the orange hues of the PiPl’s beak and legs. I don’t know why this photo strikes me as funny, but it just does. Tiny birds with huge personalities! This entry was posted in Birds, Birds of New England, Gloucester Plover, Life at the Edge of the Sea, Piping Plover and tagged #SavetheShore, #shorebirdsgoingextinct, 42 PAIRS, Beautiful Birds of Cape Ann, Charadrius melodus, CRANES BEACH PIPING PLOVERS, Gloucester, Gloucester Plover, Gloucester Plovers, Good Harbor Beach, how you can help the plovers, parking lot plovers, Piping Plover, Trustees of Reservations on July 20, 2018 by Kim Smith. 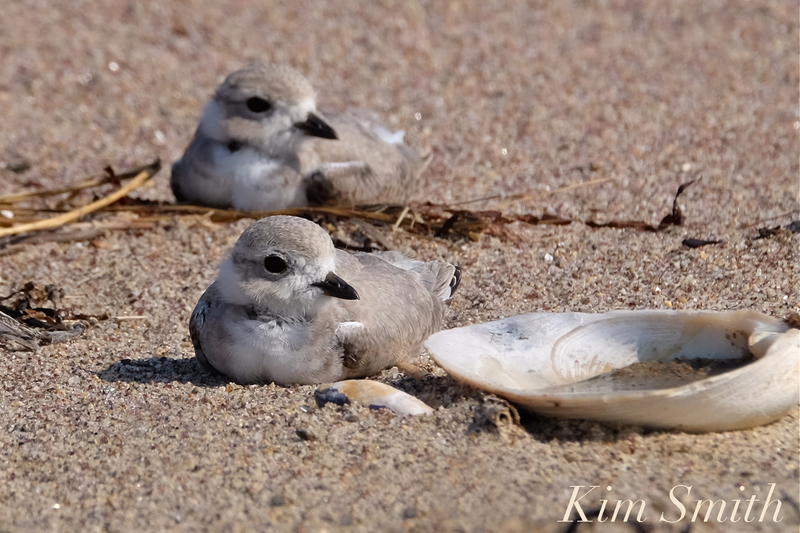 Last Tuesday we sent our letter to Mayor Sefatia and the City Councilors with a short list of recommendations, based on the past three years of daily Piping Plover monitoring by myself and our core group of volunteer monitors. 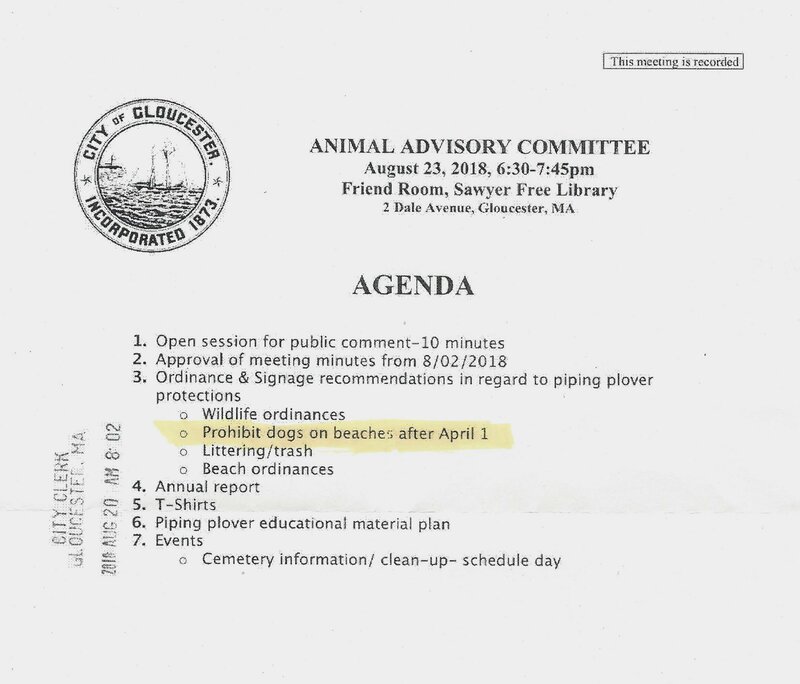 We purposefully kept the recommendations modest out of consideration to both the Piping Plovers and to our Good Harbor beach going community. Please find below the recommendations suggested by the Piping Plover volunteer monitors. 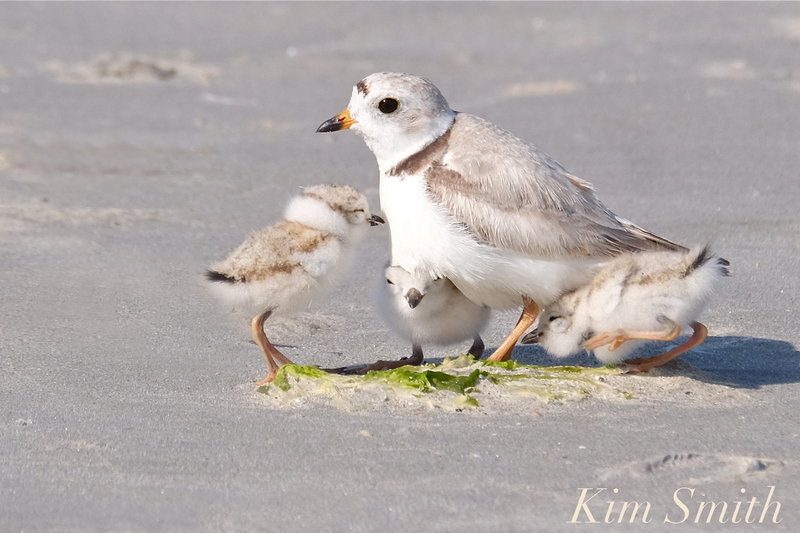 Piping Plover chicks coming in for some snuggles. 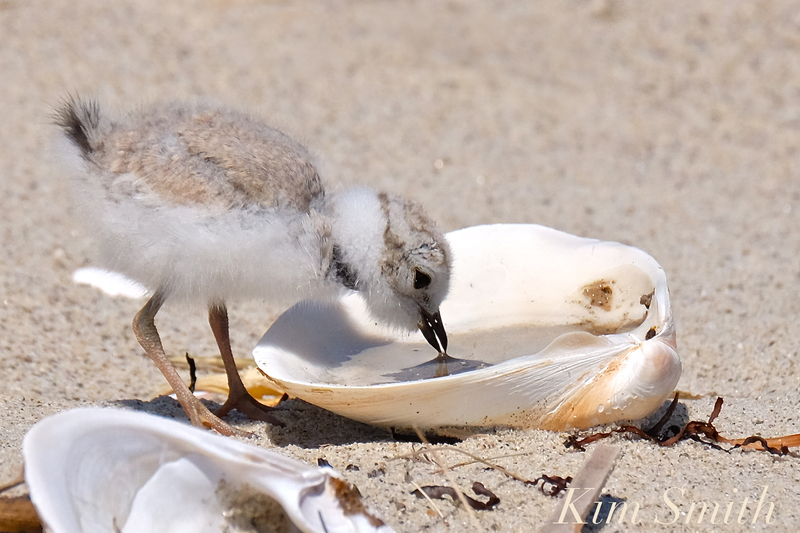 This entry was posted in Birds, Cape Ann Wildlife, Good Harbor Beach, Piping Plover and tagged #SavetheShore, #shorebirdsgoingextinct, Beautiful Birds of Cape Ann, Charadrius melodus, Gloucester, Gloucester Plover, Gloucester Plovers, Good Harbor Beach, how you can help the plovers, parking lot plovers, Piping Plover on July 15, 2018 by Kim Smith. This entry was posted in Birds, Birds of New England, Cape Ann Wildlife, Good Harbor Beach, Life at the Edge of the Sea and tagged #SavetheShore, #shorebirdsgoingextinct, Beautiful Birds of Cape Ann, Charadrius melodus, Gloucester, Gloucester Piping plovers, Gloucester Plover, Gloucester Plovers, Good Harbor Beach, how you can help the plovers, parking lot plovers, Piping Plover on July 11, 2018 by Kim Smith.